Each swim always has a back story. 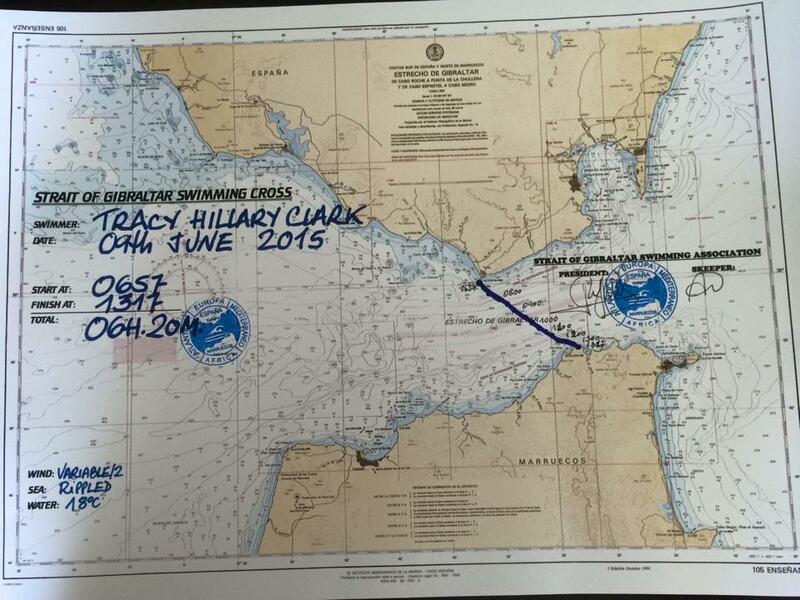 The plan to swim this swim was born in the middle of the English Channel. My friend Roger and I were crewing for Charlotte Samuels, 16 years of age from New Jersey. It was the middle of the night and Charlie had been swimming already for about 8 hours. Roger and I were discussing how we had been applying to the organiser to swim the Strait of Gibraltar but were getting nowhere with a firm date. Roger said “we should swim this together, with Otto too”. That’s how dreams start, with an idea! Some months later back on dry land, Roger phoned the organiser and successfully secured a slot for us to swim during the second week of June 2015. We took on a fourth person to join us as well. We learnt a valuable lesson in this swim. This swimmer was someone we didn’t know so well. This person showed such interest in swimming with us that Roger being him and me being me, we invited this person to join us. Never again will I swim with or have someone crew for me unless I know them very well. 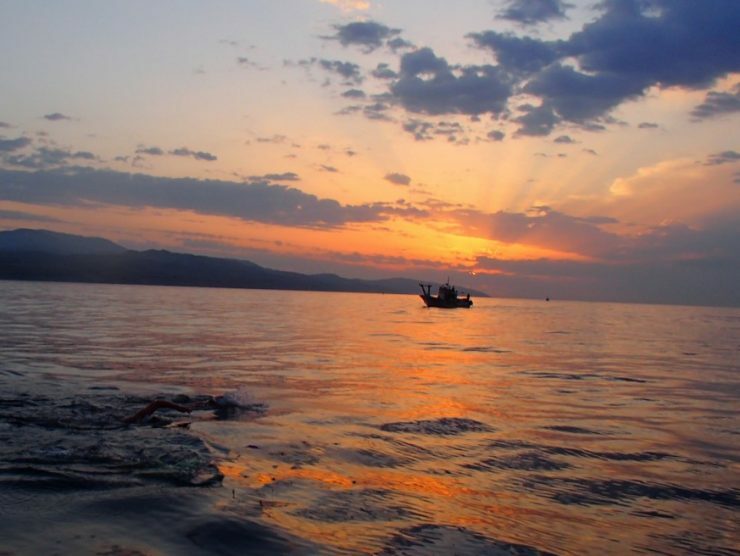 They did swim with us and it had a terrible affect on me physically and mentally – and on Roger as he could see this. On this swim you are allowed up to four swimmers to swim together. 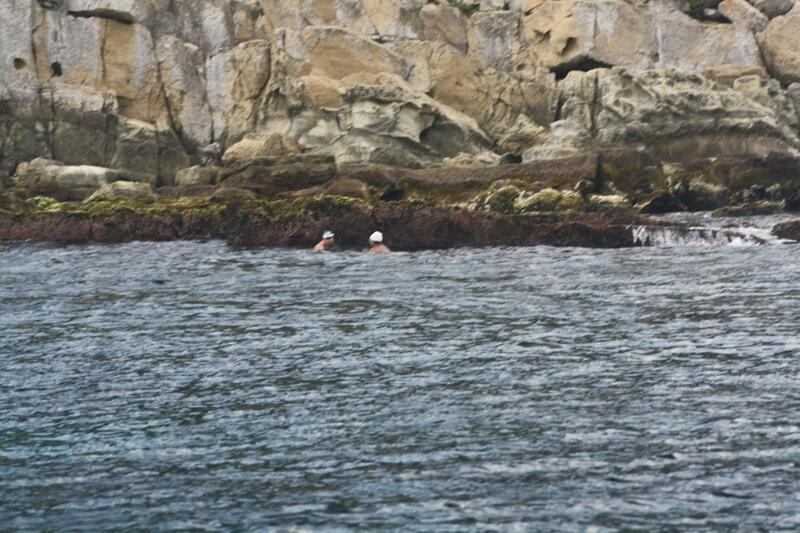 It’s still a solo swim – a tandem solo. Sadly, Otto couldn’t join us in the end due to his incredible dedication to his profession as a leading heart surgeon. Roger, his wife Lindsay and I all flew into Paris on the 2nd of June to get a connecting flight to Malaga, Spain. It was so great to see my friends again. 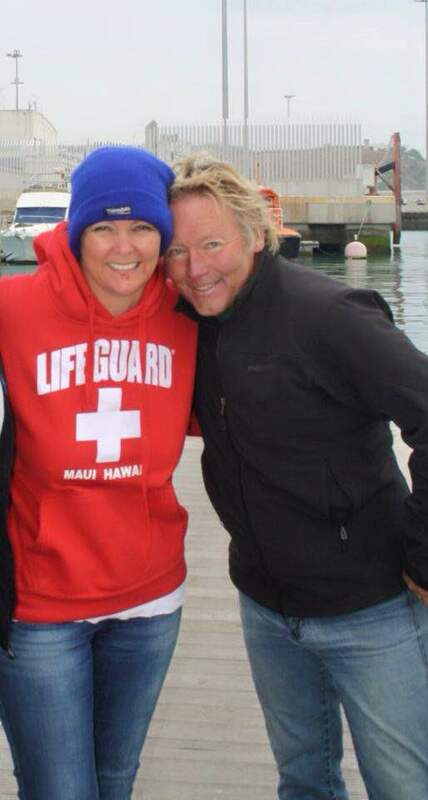 I hadn’t seen Lindsay since briefly meeting her before my English Channel swim in 2013. We had a two hour drive to our accommodation in Malaga. Our house was set down a gravel road down the side of the mountain. The first drive down there was actually scarier than the thought of the swim!! What a view though when we arrived. The house and terrace looked right over the Mediterranean to the Atlas Mountains in Morocco!!! We filled the next days with swims in Tarifa and along the coast and exploring Tarifa. One day we caught up with Thomas Kofler who had just completed a successful crossing. It was great to catch up with him. What a small world it is in the world of open water swimming. Roger had swum Manhattan Island with Thomas and I had met him on Adam Walker’s swim camp in Malta. A few days before our swim, Roger and I went for a walk to try to find a way down the cliff to get to the ocean. We found access only five minutes from our house. There waiting for us was our very own 500m swimming pool. When the tide was in we could train in it. When it was out we had to climb across rocks to the Mediterranean. Well worth it though. There was even an enclave in the rock face to leave our belongings and change out of the wind. We met Rafael the organiser. What a special man. 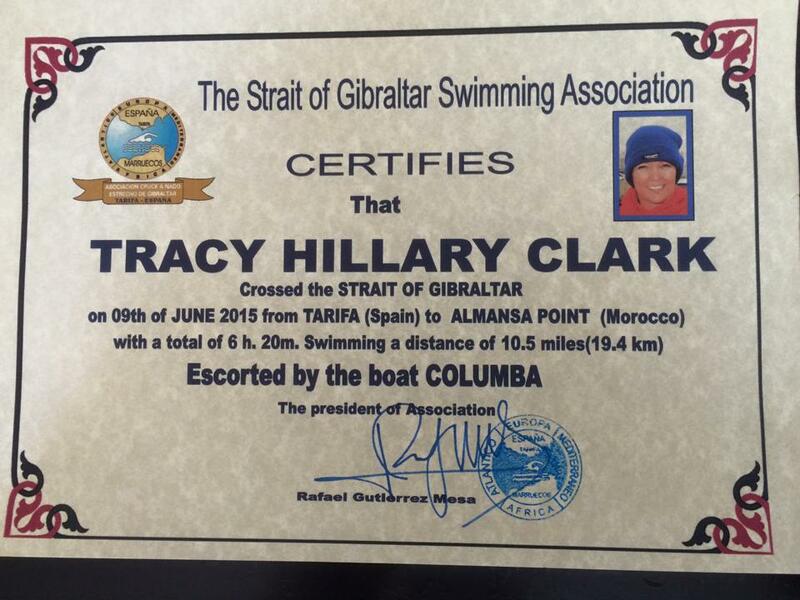 Anyone who has tried to organise a Strait of Gibraltar swim will know how frustrating this is. Well, it’s a completely different story once you are there. He gives so much confidence. We still weren’t sure if we would get to swim because of the notorious Levante winds. Every swim has it’s issues…Tarifa is the kite surfing capital for Europe so that will give you an idea of how windy it is. I know friends who have been to Tarifa twice to swim the Strait and the famous wind has not calmed down enough to even try. That’s why we must always feel grateful at the start of every swim – grateful to just be given the opportunity! On the 8th of June, we did get the call. Be down at the marina tomorrow morning at 6.30am. Roger, Lindsay and I got up early. I hadn’t slept well at all due to feeling anxious about the swim. I made porridge for everyone. We got our drinks ready and were off. We got to the marina and there was Rafael waiting for us. I said “we have a great day to swim Rafael. It’s the first day we have been in Tarifa with no wind”. Rafael replied “That is the problem today. No wind. 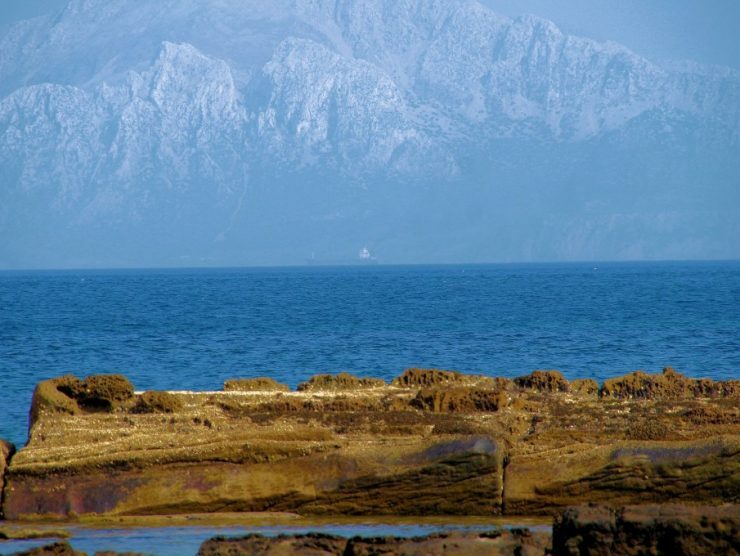 To swim to Morocco you need some wind to help blow you across. Today, everything will come from you with no help from the wind”. Oh great!!! We got on the boat and started our usual preparations – sunblock and Vaseline for the chafe spots. We arrived at the last point of Tarifa, we were instructed to jump overboard, swim and touch the rocks then start swimming to Morocco. The lead boat goes ahead and the rubber boat (IRB) stays alongside the swimmers. Lindsay, our only crew person, was in this boat with two of Rafael’s crewmen. 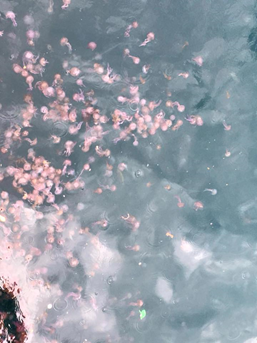 After about half an hour of swimming we swam into thousands of little purple jellyfish (pelagea noctiluca)! WOW they hurt. We started screaming and yelling and swimming with our head above the water. It hurt so much that we were actually laughing hysterically too!!! There was no way around them, the only option being swimming through them! Finally they thinned out and we could get into a rhythm again. I could see the current flowing against me. Every now and again I would see a crab whizzing by underneath me, carried on the current in the opposite direction. The water was a balmy 17 degrees yet after one and a half hours I was shivery in the water. I mentioned this to Roger at one of the feeds. He said “you’re doing fine, just stick with me”. After about 3 and a half hours, I was getting bad cramps in my legs. I said to Roger “that’s it, I’m getting out, I don’t feel great”. He said to me “If you get out, then I am too. Just stick with me, you’re doing fine”. I started swimming again but really had to dig deep to keep going. The shipping lanes here are quite different to the English Channel. They are a lot narrower so the ships tend to cross single file. The crew in the IRB stopped us and said “you feed, then we say SWIM, ok”!! A huge tanker was just passing. Lindsay passed us our feeds. We quickly finished them then the boat guys yelled “1, 2, 3 SWIIIIIM! 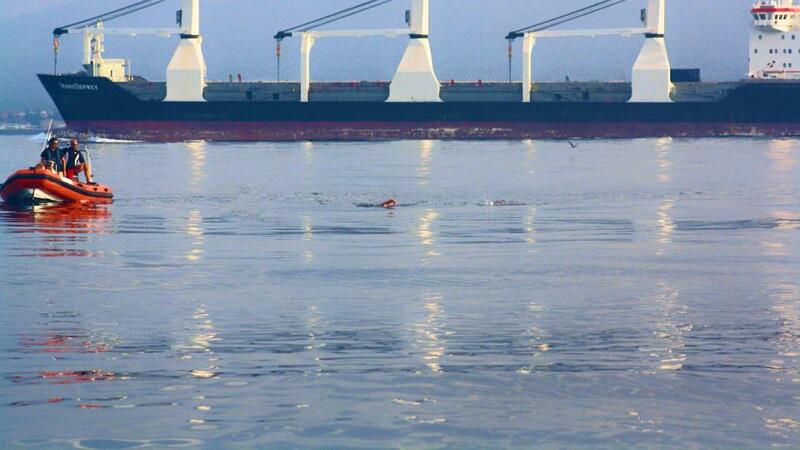 There was another big tanker coming along so swim we did!!! They stopped us in the narrow separation zone and repeated this instruction again!! I thought the boats in the English Channel were close – this was a new level!!! Finally, I could see rocks beneath me! Finally this nightmare of a swim would be over. Roger as promised, stuck with me. There was one point however, when I swam off on my own trying to get my head together. I came up to the rocks of the Moroccan coast and the boat pilots were yelling at me to touch. I stopped to see where Roger was. He was about 30 seconds behind me. I yelled at the guys “I’m not touching without my friend”! Roger swam up to me and said “have you touched”? I said “of course I haven’t, shall we touch together my friend”. And we did. We had done it!! This swim was OVER! We swam back to the IRB. They did the worst thing possible. They got us to hold our arms up and yanked us up on board by our arms. Roger was behind me and all I could hear was this huge laugh. I’m very pleased he didn’t have his waterproof camera down his Speedos!!! The IRB took us back to the main boat. I was shaking like a leaf even though I train in the North Sea and had trained right through winter. I assumed I must be getting sick. Illness had nothing to do with it at all. It was all anxiety! When we finally got to our accommodation, I sat on the terrace looking out to Morocco. Roger came out to me and said “hey, what’s wrong”? I looked at him on the verge of tears. I felt like I had let myself down but more importantly that I had let him down. He looked me in the eye and said “Hey, it’s the tough swims we should be proudest of. The swims where we have to dig deep and I saw how tough that was for you and how deep you had to dig. Did we make it – yes. 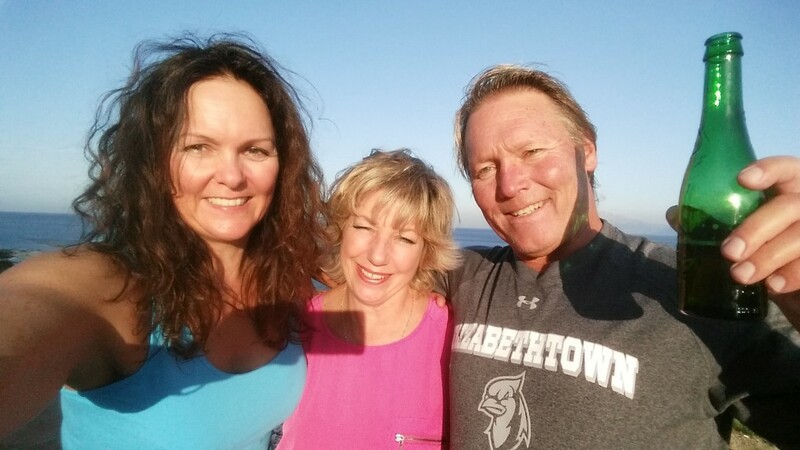 Did we swim to Morocco – yes. So be proud, be very proud of yourself because I am”. By this time I was in tears. Roger fixed that in the best way he knows how…with a beer of course – to cheers and celebrate our accomplishment. Every swim teaches me something new. Number one was I learnt I could count on my friend completely and he has proven that time and again since. Thank you! How could I have touched Morocco before you after all you did for me during that swim. Number two – I will NEVER go into another swim with an uneasy mind or with people in or out of the water that I barely know. The affects could have been devastating on the swim especially the physical affects this brought about. Am I proud of this swim – YES! 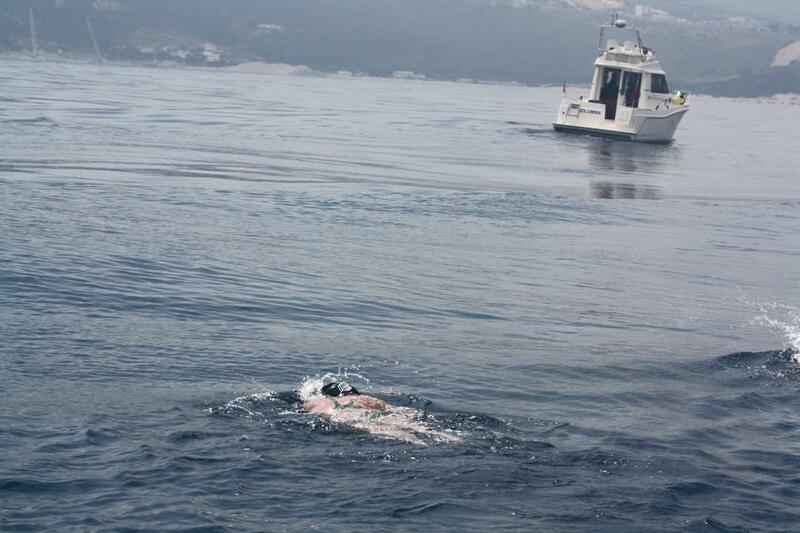 After all – we just swam the Strait of Gibraltar and that’s what this sport is about. Our time – 6 hours 20 minutes! With no back wind to help us across, not the fastest time by any means….!!! We only covered 500m in an hour twice during the swim. But we made it and that’s what counts! 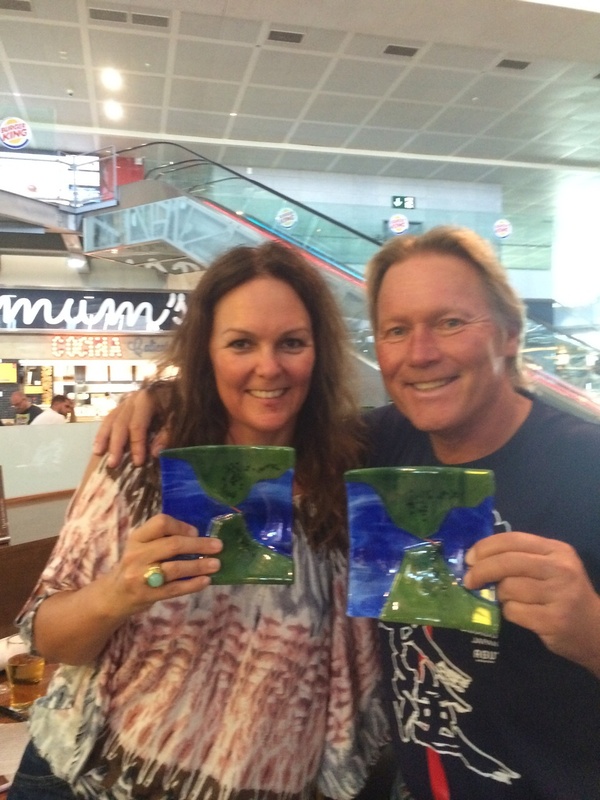 Lindsay, Roger and I celebrated that night with a great dinner in Tarifa. Roger and I had a farewell swim the next day in the Mediterranean on the other side of our 500m pool and made peace with our swim. Our view from the 500m natural pool and accommodation – looking out to the Atlas Mountains. Calm waters…a day when we needed back wind to get across the currents. Swimming to touch the rock at the start of the swim. Jellies – Pelagia Noctiluca Jellyfish. Our track across the Strait of Gibraltar. A glass dish of our track made by Irene van der Laan.